2018 Outdoor Kitchen Construction Prices | How Much Does Outdoor Kitchen Construction Cost? If you consider yourself either a home chef or a home renovator, chances are you’ve considered an outdoor kitchen. What starts with a simple outdoor grilling space could become the gathering spot of your dreams – a place where family and friends cook, eat, drink, and relax together. 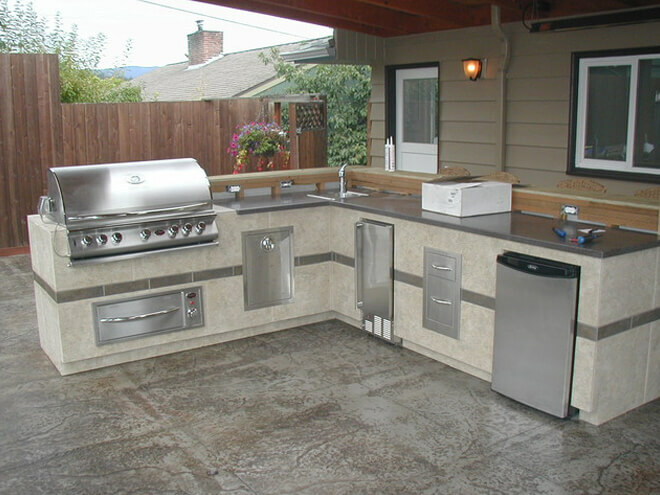 Whatever your budget, there is an outdoor kitchen construction project to suit your needs. Let’s look at the major components and break down the cost to construct an outdoor kitchen. How Much Does It Cost To Construct an Outdoor Kitchen? The average cost of outdoor kitchen construction can vary quite a bit based on the below factors. The main game changer will be its size. The bigger you want it built, the higher the price will be. Nationally, the cost to construct an outdoor kitchen will begin at $900 on the low end, and up to as much as $144,000 at the top end of the scale. Generally, most American homeowners will spend $13,200 on the average outdoor kitchen construction project. Because every construction is unique in its own way, it makes outdoor kitchen construction tough to estimate. The elements you choose within your kitchen, even the structure and paving, can have extremely varying costs. We recommend you compare estimates from multiple outdoor kitchen fitters. This way you get a quality guaranteed outdoor kitchen while saving money. You may already have an outdoor grilling area, but if you’re starting from scratch on your outdoor kitchen construction project, this is the first piece of equipment to consider. A heat source for cooking, either charcoal or electric, can be had for just a few hundred dollars. Of course, if you’d like to indulge in a fancier model you could go well beyond the standard grill and add side burners, roasting racks, smokers, or even a rotisserie! One of the factors separating a standard grill-with-patio setup from a true outdoor kitchen is the addition of a countertop. This could be one of the most expensive components of your outdoor kitchen construction project. That's because counters suitable to stand up to weather extremes can quickly become pricey. The cost to install an outdoor kitchen countertop will vary based on the size of the counter and the materials you select. This is an important decision as you plan for your outdoor kitchen construction. If you don’t install plumbing, you’ll have to do all of your cleanup inside. While walking back and forth isn’t too terribly stressful, it’ll add to your prep time, and having potable water and a clean-up sink on hand will help your space feel less like a patio and more like an actual kitchen. The good news is that plumbing installation is minimally expensive, and will not significantly impact the cost to construct an outdoor kitchen. Although all of the above elements will get you most of the way towards completion on your outdoor kitchen construction project, it won’t truly be a kitchen until your guests have tables and chairs. Furniture can get pricey quickly, but there’s no reason to bust your outdoor kitchen construction budget on tables and chairs if you don’t want to. This is the catch-all category where amazing outdoor spaces are built, but it is also where the big bucks start to add up in the total cost to construct an outdoor kitchen. Stop at the basics if you want to stay within budget, or if you want to go big, add fireplaces, climate/weather-protected TV enclosures, and built-in furniture. The sky is the limit! Remember that your location will also have a big impact in the cost. If you would like to receive a quote from a local professional for your outdoor kitchen construction project, simply enter your zip code in the space provided on this page. There's no obligation to purchase or hire whatsoever, and it's 100% FREE. Consult with an expert in your area now!